Peace protesters who have been camping in Parliament Square since May can remain there until next week after a planned eviction was postponed. A judge had granted a request from London Mayor Boris Johnson for an eviction order, citing vandalism. But three protesters lodged appeals against the ruling and a judge at the Court of Appeal has said their case can be heard, although it is unclear when. The group is protesting about several issues, including the Afghanistan war. 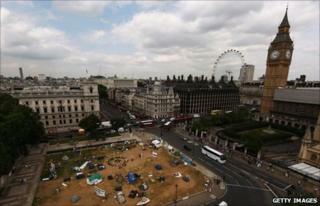 They have transformed the green in central London with tents and flags and called it Democracy Village. After the ruling, more than 50 protesters sat in the road outside the Houses of Parliament. They have now moved to Whitehall and have blocked the street to northbound traffic. Two people were arrested after climbing on to Parliament's gates and jumping into the yard, police said. Some commuters have responded angrily. One woman shouted: "I work to pay my bills and provide for my children - and I pay for your benefits." The campaigners say civil disobedience is the only way those in power will listen to them. Lady Justice Smith said the group could stay in the square until a hearing of the applications for permission to appeal went before a court. "It is plainly in the public interest that this matter is dealt with expeditiously," she said. "I think also that this is a matter of some real public importance." Mr Johnson said the camp had caused "considerable damage". His spokesman said although the mayor respected the right to demonstrate, "the scale and impact of the protest has prevented its (the square's) peaceful use by other Londoners". "Parliament Square is a top tourist attraction visited by thousands of people and is broadcast around the world each day," the spokesman added. Dot, who is one of the protesters, said after Friday's ruling: "Obviously we're very happy about this. "We're looking forward to the next stage - although I'm not sure what that will be," she told BBC Radio 5 Live. Some protesters have promised a wave of further demonstrations, dubbing the campaign "Operation Rolling Thunder". A post on the Democracy Village blog called it a "mass callout to activist groups to engage in imaginative non-violent action". On Tuesday, a High Court Judge said veteran anti-war campaigner Brian Haw, who has lived in Parliament Square since 2001, had been camping lawfully.